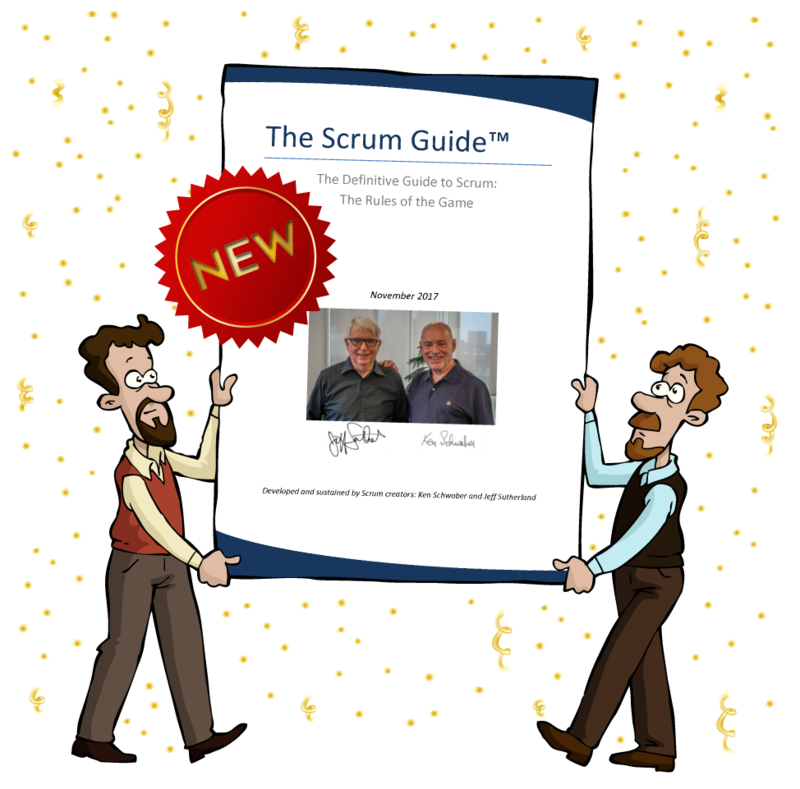 Today (November 7th 2017) Ken Schwaber and Jeff Sutherland released an update to the Scrum Guide. The Scrum Guide is the definitive definition of Scrum, authored by Ken and Jeff, the creators of Scrum. The Scrum Guide describes the Scrum framework. And, it is only 19 pages long. By keeping the definition short, it not only forces a clear focus, but also reminds everyone that it is not a methodology. Process emerges from use of the framework in response to the situation that the team is in. Because Scrum is focused on complex problems, defining a complete methodology is impossible. Instead Scrum provides a simple framework that encourages the right empirical process to emerge. That has allowed over 12 million people to practice Scrum today whilst solving VERY different problems in very different situations. What is new in the November release of the Scrum Guide? Use of Scrum – From its Software Development Roots Scrum has evolved to be used in many different contexts. These contexts highlight the flexibility of Scrum and how an empirical process, values and focus on learning can help solve any complex problem. By adding this section Jeff and Ken provide a way for Scrum Masters not in software delivery to justify the use of Scrum. It helps resolve the age-old question ‘Scrum is only designed for software development’. Refining the role of the Scrum Master – The Scrum Master is a key role in driving change within any organization by serving the team in their use of Scrum. This update of the Scrum Guide increases the clarity of the role by adding some words around what they do and how they do it. The Daily Scrum – Perhaps the most popular event in any agile adoption but often this daily event becomes a status meeting instead of focusing on inspection and adaption. By changing the emphasis from the 3 questions and describing other ways the Daily can be run re-enforces the idea of inspection and adaption rather than status. Time Box is a maximum length – It seems a simple idea, but for many a time box is the time, not the maximum. This leads to silly behavior, for example where everyone sits around for the 15 minutes for the daily, or insists that a Sprint Review takes x number of hours. The idea of a time box in Scrum is to focus the team, reduce amount of work being worked on and keep the rhythm of work. Continuously Improve. Scrum is a framework that helps teams deliver work in a complex environment. That means the team should always be looking for better ways to work, to learn and to deliver more value. By adding the idea that the Sprint Backlog includes one high priority improvement the Scrum Guide reminds teams that improvement is NOT optional and that every team should have at least one thing they are trying to improve. The changes to the Scrum Guide by Ken and Jeff not only improve the clarity of the Guide, but also encourages us to re-read it. Sometimes it is good to be reminded of that practice as it is surprising what little ‘idea nugget’ you might have missed before.